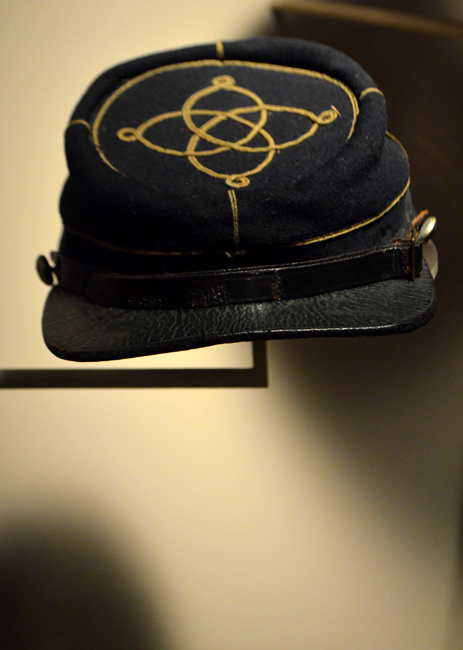 One of the "Rhett's Recommendations" on the Gone With the Wind Trail list is the Atlanta History Center, specifically their signature exhibition, Turning Point: The American Civil War. 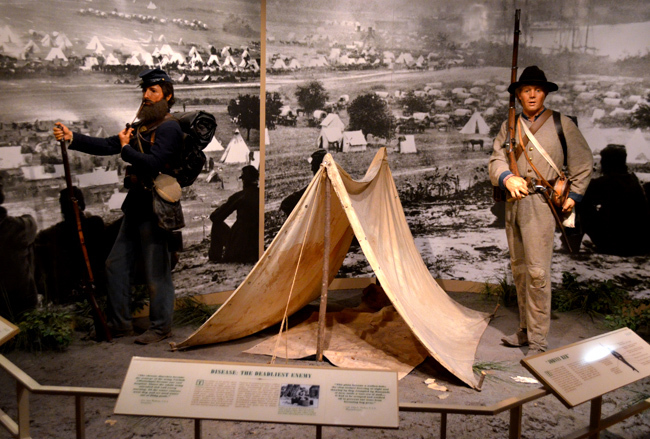 Featuring more than 1,500 original artifacts, this is one of the largest American Civil War displays in the United States. 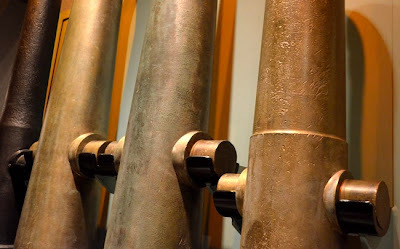 I've been a member of the Atlanta History Center for years and have been visiting it even longer. But I've never explored this particular exhibition with Scarlett O'Hara in mind, let alone having delved into the artifacts, placards, and videos to glean a stronger understanding of what Civil War life was like, which Margaret Mitchell grew up hearing about. The exhibition is brilliant at presenting both sides in a non-biased, highly informative manner...I was impressed. It does seemingly have more artifacts from the South, but when you look more closely, you see that there are artifacts from practically every State that took part in the War. And they're not shy about telling the horrors of war. As we've learned from other various sources, the greater majority of deaths during the American Civil War were due to disease and hunger...as a matter of fact, soldiers spent the majority of their time waiting for combat. One display shows the number of people who fought in the War (the North outnumbered the South, by far) and how many died (more Northerners died than Southerners). There are lots of surprising facts like this, and revelations of what War life was really like. 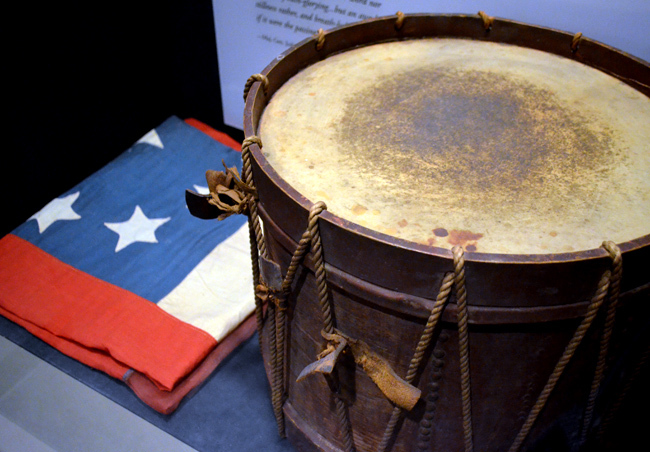 Among the 1,500 original artifacts on display, there are cannons, lots of uniforms, and quite a few flags, including the one that was flying over Atlanta when she fell to Sherman. There's a Union supply wagon that was used by Sherman's army...this exhibition is quite surreal. To think that ALL of the items you're taking in were used to change the history of our country—and all the people who died for that change—it's totally overwhelming. 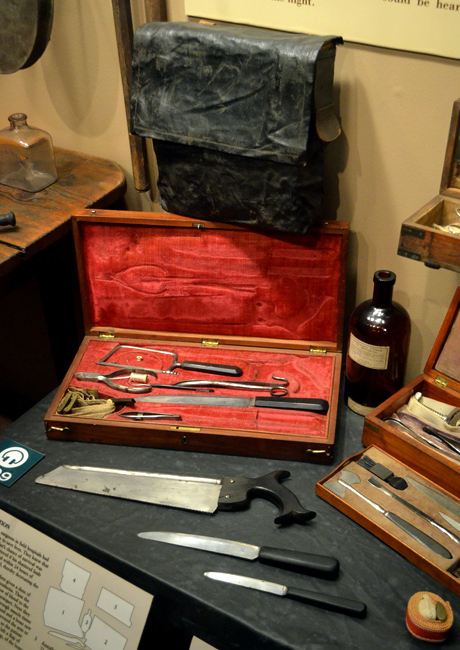 Having served in the U.S. Navy, I found myself particularly drawn to artifacts having to do with the naval forces on both sides. 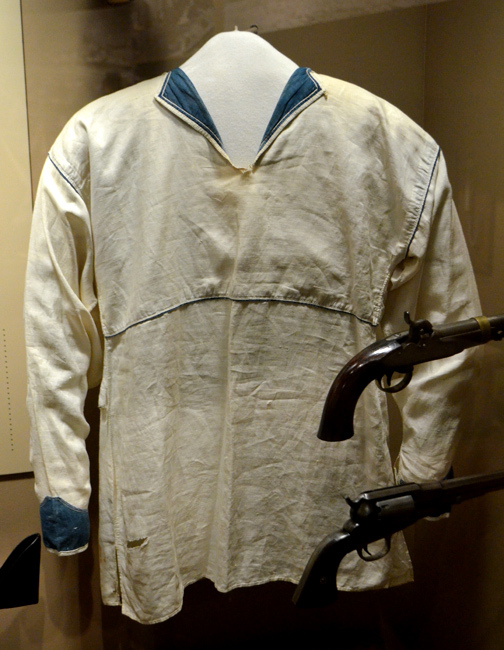 This particular linen U.S. Navy jumper (above) was worn by Stephen C. Roach, a Carpenter's Mate, when he served aboard the U.S.S. Kittatinney. The Museum also has on display the logbooks from the C.S.S. Shenandoah, which had been in Alaska when the war came to a conclusion, meaning her crew didn't know that the War was over for a number of months. Instead of returning to home port, the Shenandoah was sailed to Liverpool, earning the distinction of the only Confederate ship to circumnavigate the globe. Surprisingly, the number of people who served in the Navy during the American Civil War was practically negligible, but the Union used their superior numbers to gain access to areas where they could attack from land and from the water simultaneously, giving them a great advantage. I've been fascinated with swords since I was a kid and aside from what they're actually used for, there are some incredibly handsome swords in the world...Civil War swords being no exception. 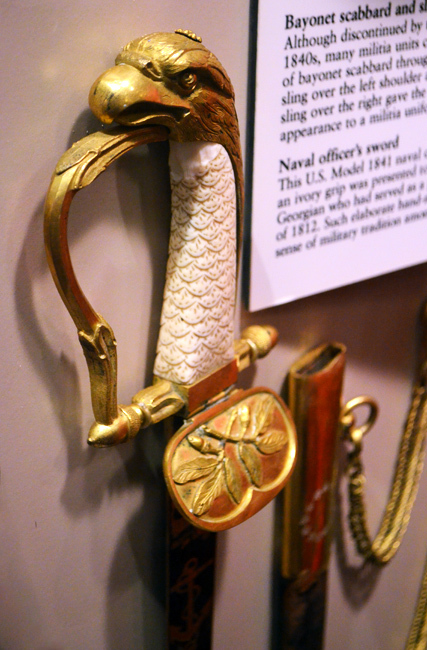 Take for example the Naval sword above. We all know that war begets new technologies. All involved sides are desperately engrossed in research and development, with an unprecedented eagerness nonetheless. One of the fairly major advantages the Union gained during the war years was the widespread use of sewing machines. 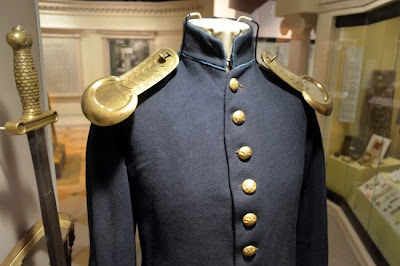 They existed before the War, but did not come into popular use until it was "discovered" that with a sewing machine, a uniform could be made in one-tenth the time it took to hand-sew one. 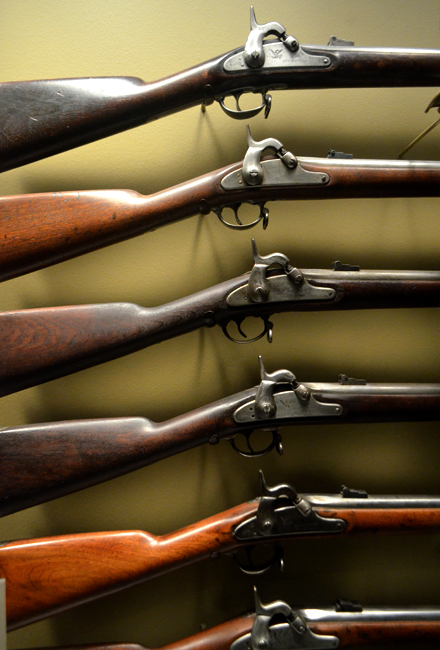 I've never been to a gun show, although I was an expert marksman with an M-16 when I was in the Navy—yes, sailors have to learn how to use guns, too—so I found myself aghast at the number of guns on display...but even more taken aback that they're all more than 150 years old! The collections in this exhibition are quite phenomenal, and quite extensive. 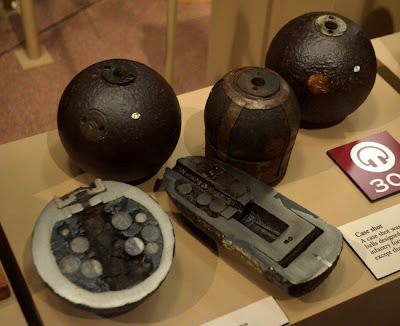 One of the more disturbing artifact collections, and this isn't just me being sensitive, is the artillery. The various kinds of artillery are arranged and displayed to demonstrate the kinds of damage they do. The placards are fairly gentle in their verbiage, but the visuals conveyed are the same, regardless of the words used. I can't help but think that that's actually part of the reason for exhibitions like this. To share and remind us of the horrors of war. Not only the events leading up to war, or the horrors of war itself, but also—and the exhibition does this as well—the lasting effects, in our case even decades and decades later. Turning Point: The American Civil War is poignant, thought-provoking, and an exhibition that I believe everyone should learn about. A war where 670,000 people died should not be forgotten, and the Atlanta History Center is helping to make sure that doesn't happen. Whether you're a history enthusiast, Civil War buff, or just interested in human behavior, this is an exhibition that you'll want to see. I encourage you to allow plenty of time...remember there are 1,500 artifacts with placards, video, interactive learning stations, and you'll want to make a few photos. Speaking of photos, head over to the wanderlust ATLANTA Facebook Page to see lots more photos from this particular visit...there's some great stuff here!